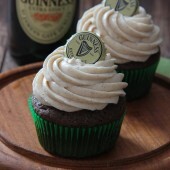 Rich and moist Guinness chocolate cupcakes, topped off with a sweet cinnamon cream cheese frosting. Perfect for St Patrick's day celebrations. Preheat oven to 350°F. Line a regular cupcake pan with 8 liners. In the bowl of a stand mixer, cream together butter and sugar. Mix in egg and vanilla, followed by sifted dry ingredients. Slowly incorporate Guinness and sour cream, mixing until batter is smooth and streak free. Using a large cookie scoop, add one scoop to each prepared liner. Bake cupcakes for 18-20 minutes. Allow cupcakes to rest in pan for 3-5 minutes or until easy to handle. Cool completely on a wire rack. When ready to frost cupcakes, in a large bowl or stand mixer, beat together frosting ingredients until smooth. Add frosting to a prepared pastry bag with piping tip or frost as desired.